This weekend I decided to go camping and fly fishing in Shenandoah National Park. 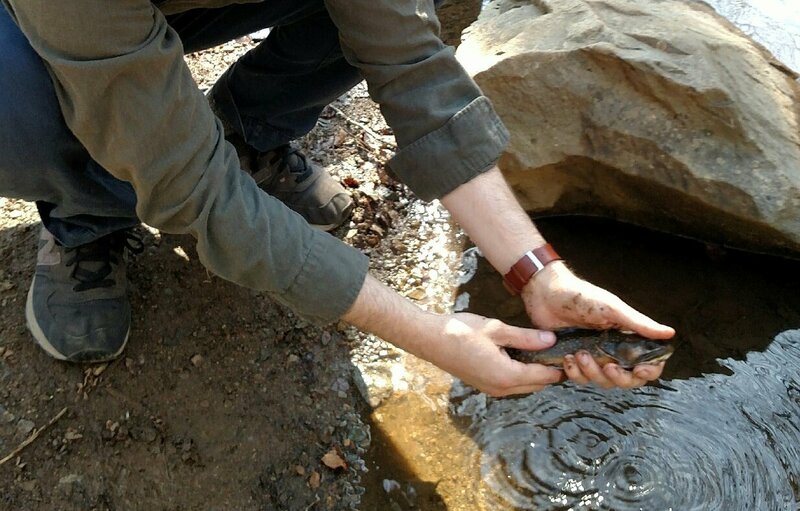 I’ve been looking forward to visiting the park since moving to DC, and I love fishing small streams for wild trout. Growing up in North Carolina, small trout streams remind me of the reason I started fly fishing. I enjoy spending my free time outdoors and surrounded by natural beauty. I spend most of my time in a city, and it’s important for me to have these stress free and contemplative moments. My friend drove up from North Carolina, and we set up camp in the Big Meadows area. I knew that many of the streams here hold wild trout, so I read up on a few options and figured we’d mostly forge our own path to the many mountain streams. The primary focus for the first day was Rose River, and we hiked most of the length of the river. It’s best to start in the lower sections of the stream and work your way up river. I’d recommend starting at the Rose River Trailhead and making your way up. This allows you to cast upstream into the terraced pools without scaring the fish. We mostly used a dry and dropper rig with a size 16 Parachute Adams, and various size 18-20 nymphs as the dropper. More often than not, these trout were happy to take a well presented dry fly. We saw plenty of baetis. There are a variety of features to Rose River, and many different ways to fish it. For the deeper pools or faster water, I’d recommend tightline or indicator nymphing with two sizes of flies. If the water is slower and you can get a good drift; don’t hesitate to tie on a dry fly with a dropper. Never underestimate the size of the pool, because we found many trout in very small stretches of water. My friend caught his largest brook trout of the day in one of the smaller runs we came across. At one point, we passed a group of hikers who were standing in front of a promising looking pool. It was small, but I thought there was a chance it was often overlooked by any anglers. 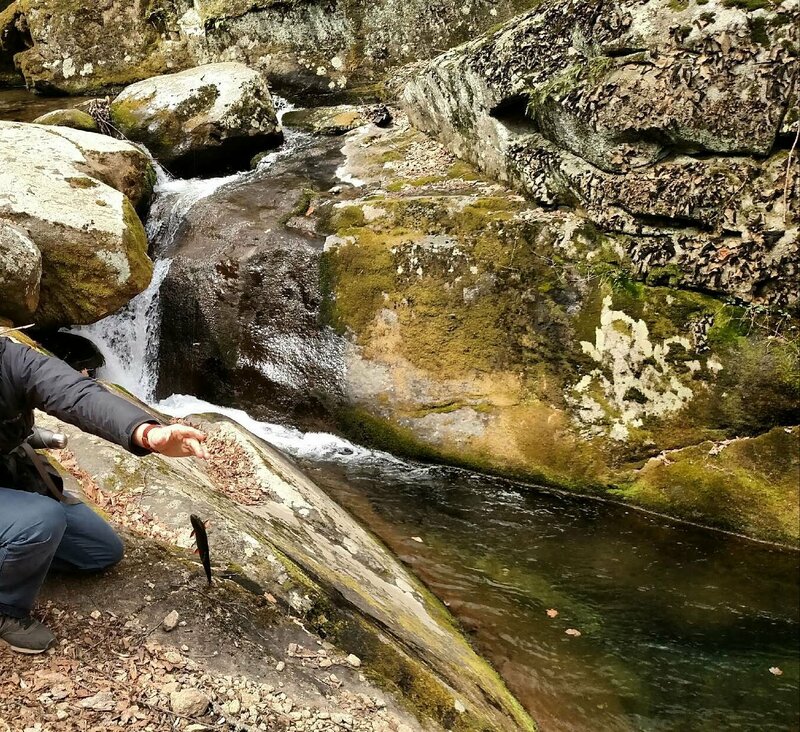 As I started preparing my rod to “bow and arrow” cast into the pool, I overhead one of the hikers say, “There’s no way there are fish in there”. Seconds later, a small brook trout grabbed the dry fly, and I heard a few gasps from the hikers. They came up and wanted to take a closer look. Many of them had hiked the trail many times, and mentioned they never knew that trout lived in the stream. Some of the locations are hard to access, but barbless hooks make it easier to release the fish. An interesting aspect of Rose River is that it has a problem of invasive Brown Trout. If caught, the park requires that you either keep the trout or dispose of them away from the river. If the brown is over 7″, anglers must keep it, and if the brown is under 7″, you must dispose of it away from the stream and any park roads/trails. We actually didn’t come across any browns, and never had to deal with the situation. It’s something to keep in mind if you plan on fishing Rose River to help the park reach their goal of elimating the invasive species. Here’s one of the first of the day which was about 9-10″. All said, it was a nice trip to the park and I look forward to going back in the warmer months. The advantage to an early spring visit is that there seems to be less crowds, and a little less foliage to hamper your casting. There are plenty of trout here to catch, but even if you end the day empty handed; it’s never a waste in a place like this. I enjoyed your write up of what must have been a fun adventure. Glad you are making the most of living in the DC Beltway area. Amazing isn’t it, how little water a brook trout can live in so long as it is clean and cold. Thanks Sam! It never ceases to amaze me. I always like to spot small brook trout as well, and found a few in this stream holding in about 2 inches of cool and clear water. Definitely tailor-made for their environment.